Karimnagar in Andhra Pradesh has highly skilled artists practicing the delicate craftsmanship of filigree. Spoons, buttons cigarette cases, boxes, ashtrays, buttons pill boxes, jewelry, paandans and perfume containers. Designs of Peacock, parrots and fish are depicted in the perfume containers. The artisans display mastery is twisting the delicate silver wire into delicate loops knitted in a zigzag pattern resulting in an intricate lace like appearance. This is an ancient art of metal work practiced in the traditional way. Silver filigree has Cuttack as a centre. The Silver filigree craft is locally known as Tarkashi in Orissa. . 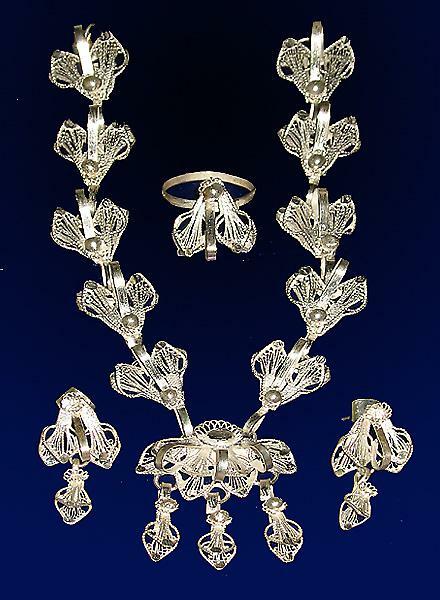 The artifacts are made of alloy which contains over 90% of silver and to compete with the changing times new methods are being used..The artists have maintained the craft by keeping themselves updated with the market requirement . Platinum polish is also used and it leaves glare on the item. The silver is extracted through a series of consecutive smaller holes to produce fine strings of silver threads. The string is the specialty in the filigree jewelry.. Traditional items include figures of animals, birds and flowers. Konark Chakra and temple are the favorite mementos while a still depicting the chariot of Arjuna driven by Lord Krishna is quite popular. Brooches, ladies bags, pendants, earrings and hairpins and other utility items like the trays, plates, cups, candle stands bowls, ash-trays, , incense containers, animals, birds, flowers, peacock and many more.